Now with Select Fire kiln controllers! With a maximum temperature of 2300°F, these kilns are ideal for firing stoneware and porcelain. Exteriors are constructed of welded steel, with a heat and rust-resistant finish. The high-fire refractory of the firing chamber and its high-temperature insulation keep heat loss at a minimum. Firing time varies from 5 to 8 hours, depending on the size of kiln, firing speed, load, and voltage output. Lids are specially vented and rest on ceramic fiber rope that encircles the top of the firing chamber for a perfect seal. A sprint-type latch allows lids to expand and contract. All models have spring-balanced lids. Long-life A-1 Kanthal wire element coils fit into deeply recessed groooves in the firing chamber walls, and can easily be removed when necessary. 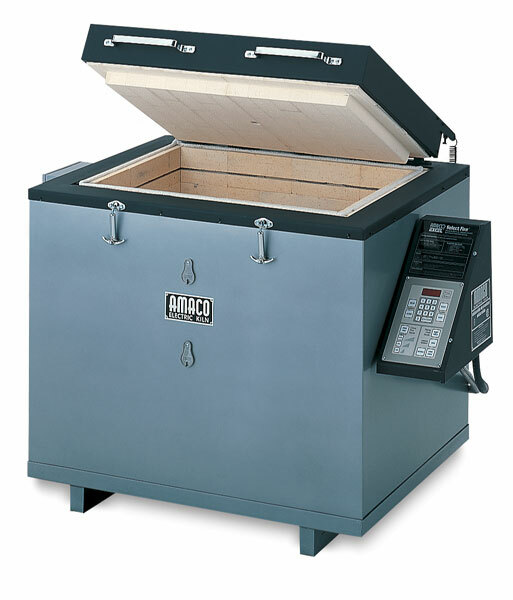 These top loading kilns are well built and highly recommended for studio or classroom. UL and CSA listed. Select Fire kiln controllers mean more precise control, greater consistency, and less time monitoring firings. How did we ever live without it! Set the kiln to fire by temperature or by cone number (Select Fire automatically converts one to the other) at one of three pre-set firing programs — slow, medium, or fast. Use ramp/hold programming to create your own firing profile by selecting up to six segments of temperature change. Hold and store your program for your next firing. Digital readout displays temperature in Fahrenheit, Centigrade, and shows what program currently is in use. Use automatic delay firing to start up to 99 hours, 99 minutes later. In locations where off-peak electric rates are lower, use delay firing to save on energy costs. Selecting the right kiln for your needs can simplify your ceramic studio or classroom and facilitate successful use for many years to come. This video shows the variety of Amaco Excel kilns available and explains some of the key features so that you can make the perfect decision for your environment.